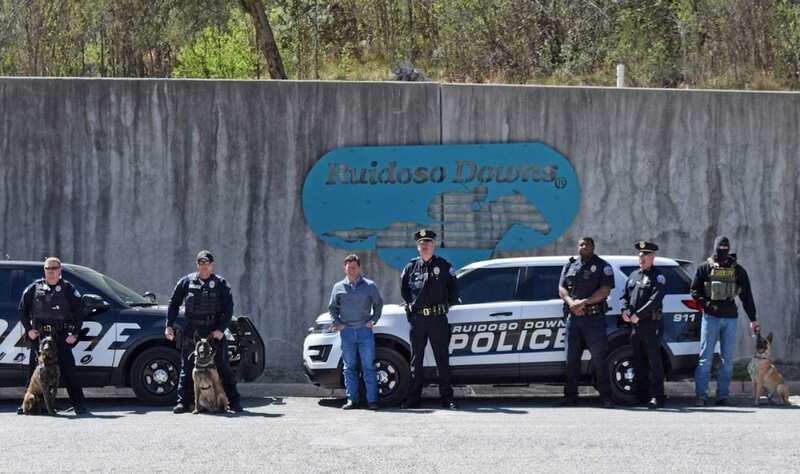 Ruidoso Downs President and General Manager Jeff True revealed this week that the track has begun a new method of hunting for prohibited drugs during its Quarter Horse meet: a dog. True outlined the program at the University of Arizona Global Symposium on Racing earlier this week. The track owns one dog, a Belgian Malinois who has been trained to detect clenbuterol and albuterol. True said the dog has been taken to sweep cars coming into the stable gate in the mornings. So far, the dog (whose name is Chini) has picked up roughly a dozen substances, both of equine and human use. Chini is trained to pick up on about 12 drugs, as well as the plastic of an unused syringe. This entry was posted in NL List, The Biz and tagged albuterol, clenbuterol, drug in racing, Ruidoso Downs by Paulick Report Staff. Bookmark the permalink.